This is an experience I had years back when Hawaiian Hall at Bishop Museum was undergoing restoration. I love these experiences and enjoy sharing them. I hope you enjoy it too. The sun was out, and the whole Koolau range was in view. Sun and blue skies equal no people at the museum. 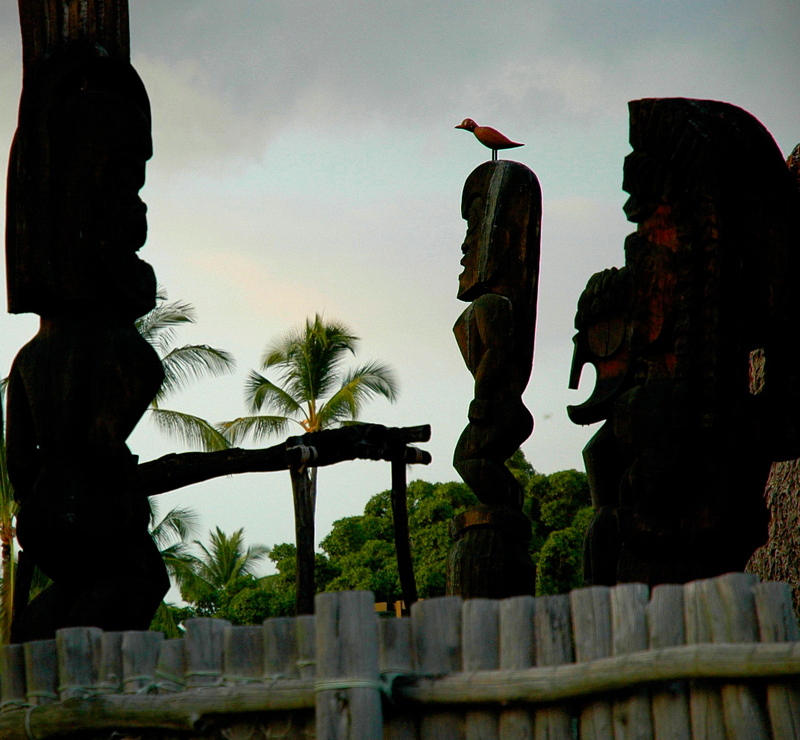 As I stood in the main entrance a few people passed into the Kahili room. Maybe a couple viewed the art in the vestibule. In the quiet I heard someone singing. Now you have to remember that lots of people have had ghostly experiences in this hall and I was not sure what I heard. But the sound was definitely there. Then it became muffled. I didn’t want to trudge up the two flights of stairs to check what was going on. The only people who had ventured to the upper exhibit area was a very pleasant Hawaiian couple. But I still heard the singing and it was coming from above. I called over to security and told them to look into their cameras to see if someone was singing in the photo gallery. Now I could hear the singing clearer and it sounded like chanting. The young guard came through the main doors and headed up the stairs. Soon the chanting became louder and I was curious. So I ascended the stairs also. The doors to the exhibit hall had been closed and now one was ajar. I knew that they were supposed to be opened. I entered and saw the guard talking to the male of the Hawaiian Couple. The woman was in a corner, arms raised in supplication, moving gracefully,chanting. I approached the guard who was now in a mildly heated conversation. The Hawaiian man was being told that he could not be chanting or singing or doing anything in the museum without permission and that they had to leave. In the past there have been demonstrations and even artifacts have disappeared and the guard was worried that this could be some kind of demonstration. 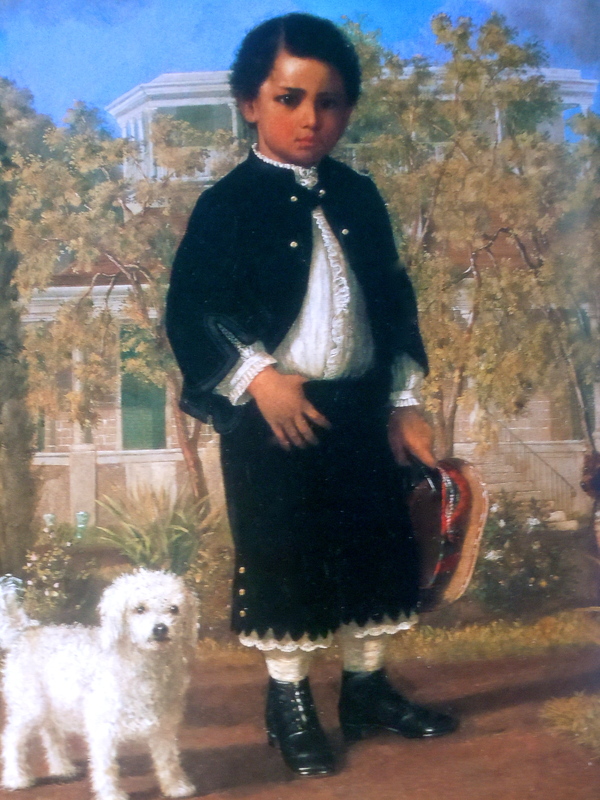 The gentleman was stating that the things of the museum were part of his ancestry and he gestured around the room. The woman was still chanting as the discussion went on and then the security received a call from the office asking what was status of the situation. He stated that a woman and man were singing and he was trying to get them to leave. I on the other hand saw that they were chanting as I had seen many times before in the museum. I did not feel that they were protesters but that they were paying their respects. Although other chanters always requested permission before doing so. After a time the woman finished and came over to us and started speaking Hawaiian. I only understood a word here and there but, really, had no idea what she was saying. When all was said and done it was explained that she had come to say a prayer or a pule. At least that is what I think she said. They were from the island of Hawaii. 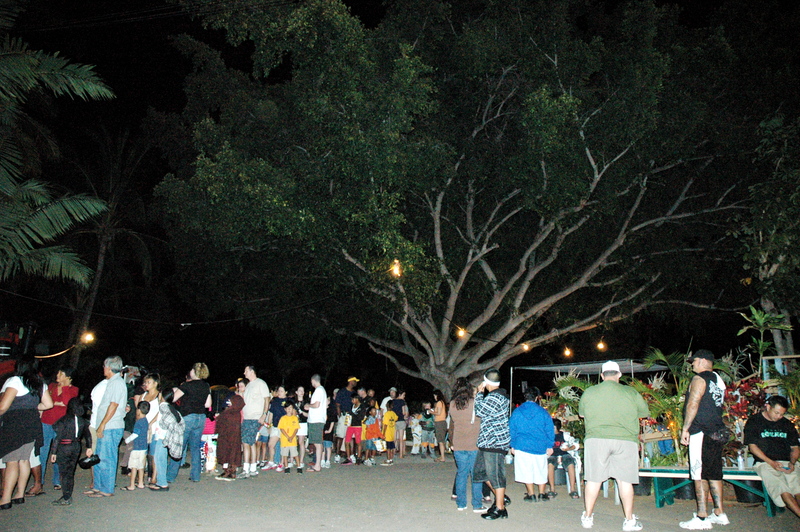 The woman said that she had been called by the spirits of her Kupuna or ancestors. They had been appealing to her to please come to the museum as they were being neglected and hid away. She said that she came to reassure them and to honor them and help them to be at peace. Now she is telling me this in half English and half Hawaiian so I am not sure that I got it all correct. I just knew that maybe my boss, Kealoha, would arrive soon as he would know how to interact. Really the chanting was beautiful and she was graceful and kind. And I guess when it comes to the Hawaiian culture my heart goes out to that community for all the suffering that has taken place in the past. 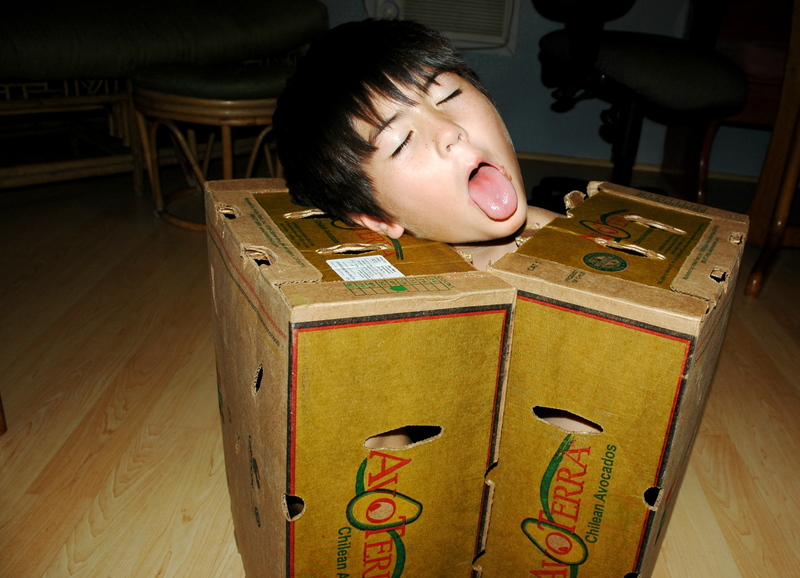 I knew that once Kealoha arrived he would make it all well. I mentioned that though nothing was wrong with chanting and that what she was doing was fine they just needed to make arrangements and then I explained to her why the room that she was in was so changed. She was upset at seeing all of the artifacts, that were once in the room, were gone and it was now just paintings. She felt that was why she was being called. I told her that the room had been restored to its original condition like it was when the Museum opened in 1898. I told her that many things were going to be different once all restoration was finished and that much more of the Hawaiian artifacts were going to be brought out that weren’t displayed before. She was very happy to hear that and asked if she could go on to the other exhibit areas. I said it was fine as long as she didn’t chant and that Kealoha would be in soon and she could talk to him. As I got back to the main floor many people had arrived and so I announced that I would be doing a tour and people began to gather. As I started to talk, Kealoha and the Hawaiian couple entered into the Kahili room. Soon sounds of chanting could be heard. All the heads turned. I explained what it was and let them listen for a while which they did with much appreciation. As I was into the middle of my tour the coupled left and nodded as they headed out the door. I felt good, I believe the kupuna, also, felt good, and certainly the visitors enjoyed witnessing a bit of the Hawaiian culture. I love it when that happens. The ancestors had called, they were heard and she answered. It was the night before Halloween. 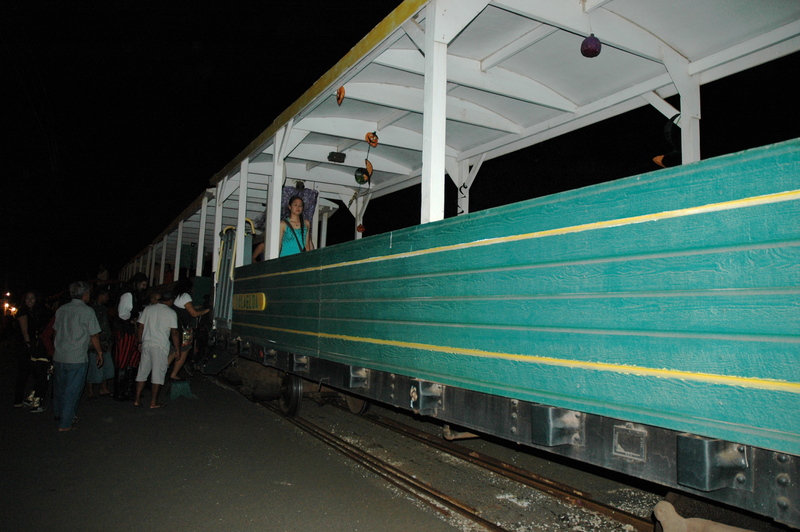 We had made our reservations for the Railroad ghost tour on the first of October as it sells out every year. 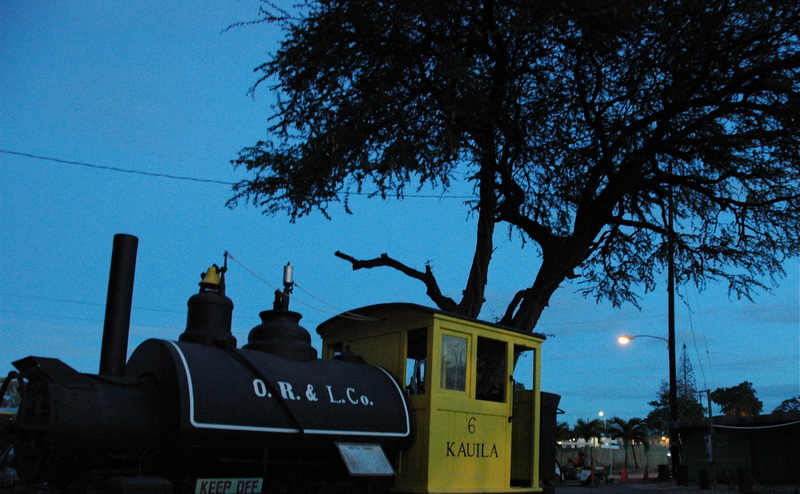 Hawaii has a railroad. 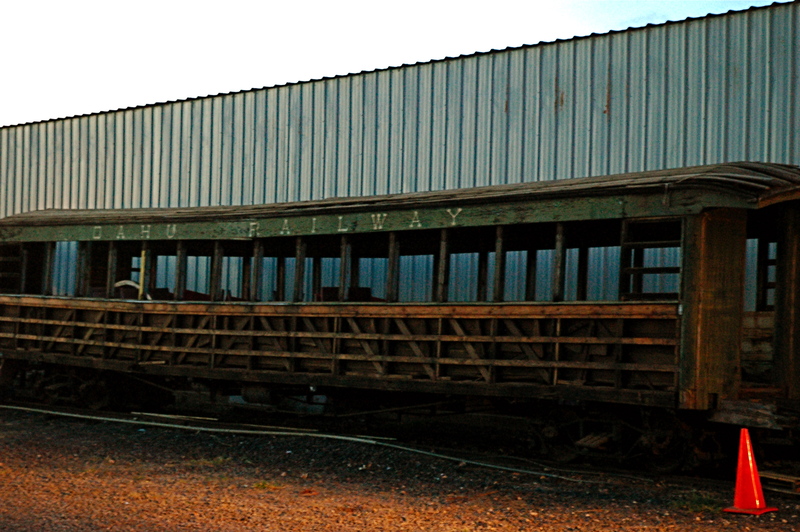 Not many people know that but it was built to haul sugar cane and sugar cane workers to and from the fields. Now you can book a ride any Sunday and toodle on out to the west side of the island and take in a spectacular view. Go to this site. http://www.panaviz.com/scenic-oahu/hawaiian-railway-society/ Use it’s panorama view. It is a treat. You will want to get down to the Hawaiian railway society johnny on the spot. I love ghost stories and Hawaii abounds with them. So I was so excited when we got there that night. We had arrived an hour early so that we could look around at the trains first. Not knowing what to expect as it was our first time here. It did not dawn on me what type of ride this was going to be when I saw, flocks and flocks of little kids in costumes running around. My daughter had brought an Ipod for my grandson to listen to as we rode the train. She did not want him getting scared from the ghost stories that were going to be told about the Ewa plain as we rode along at night through the fields on the train. This is one of the old railroad cars that probably is going to be restored. This car needs to get moving so it won’t gather anymore dust. 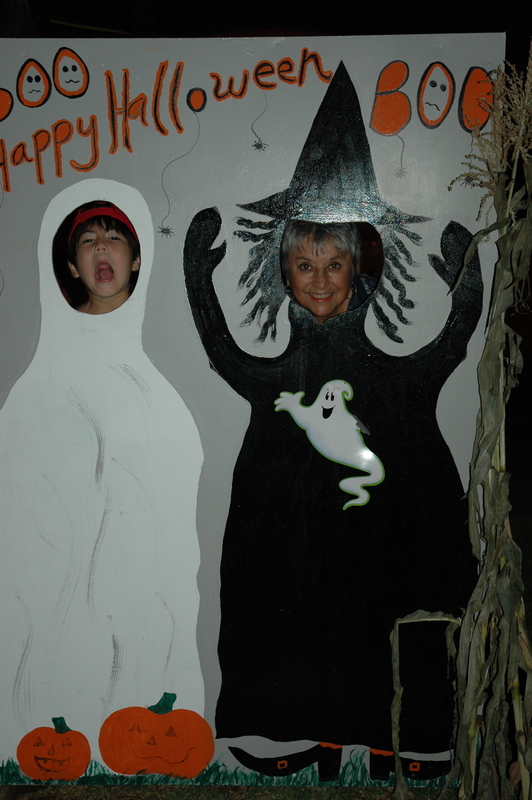 We were surprised at all the Halloween decorations and picture opps there were. If we had known we would have put Nico into a costume. But he was such a ham he did just fine behind these props. We all got into the spirit as we waited for our train. They even had food booths set up. 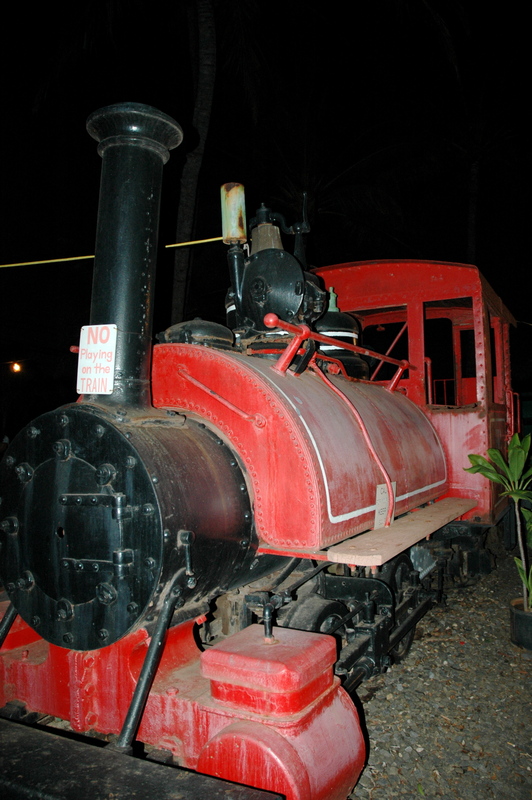 The Hawaii Railway Society uses this night as one of their big money makers. This is how they pay to restore the old trains. We had a hot dog as we counted down the time. A half hour to go so we stood in line. None to soon either as we were about tenth. Before long as you can see in the first photo the line started snaking out of site. At last our turn came and we got on board. I was so excited. I love to collect ghost stories and was thinking about what I was going to tell everyone at the museum when I next gave tours. The whistle blew and of into the night we rode. I couldn’t wait for the guy with the deep voice who in the style of “Inner Sanctum” ( http://www.radiohof.org/adventuredrama/innersanctum.html) would start telling the stories that had been passed down from cane workers to offspring to story collectors. Then a female voice came over the intercom telling us to make sure to stay in our seats and not to get off at the other end of the track as you may be stuck out their a long time. (Yeah, right like who in their right mind would get off the train.) In her shaky, kind of old lady, sing song way she went on with the announcement and some really, really corny jokes. I turned to my daughters friend and whispered to her, “I hope she’s not going to be the one to tell the ghost stories because her voice just ruins everything.” The friend nodded in agreement. Then the irritating voice went on with more jokes and more jokes. The bloody hand in the closet, the wedding dress bought from the undertakers, and I don’t know what else because by that time I had totally tuned her out and was watching all the people waving from the houses as the train passed by. It was a beautiful night, the kids were screaming as costumed goblins popped up on the sides of the train as it came to a stop and my daughter had removed the ear plugs from grandsons ears. 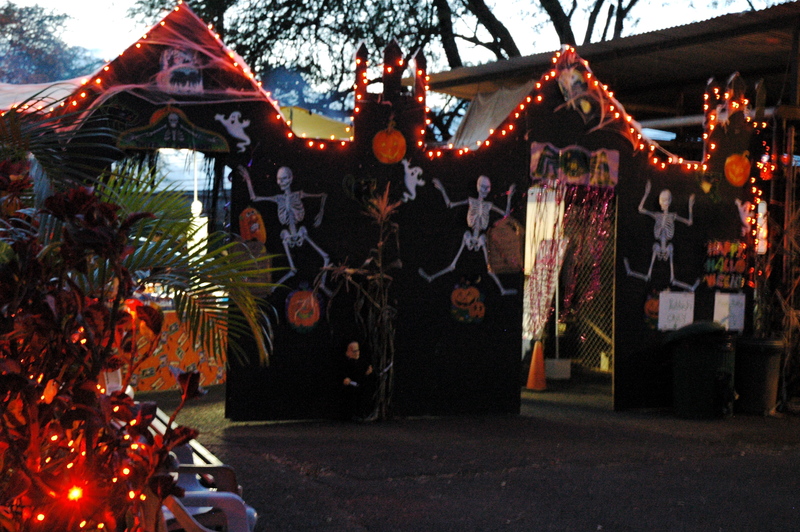 What the heck, it was Halloween and this train ride was for the kids and they were loving it. The woman’s irritating voice was perfect for the little ones and they all enjoyed the jokes. In the end I was happy I did it and certainly happy that my grandson went home with a smile on his face rather then terror in his eyes. I will just have to go back to collecting stories on my own. Maybe I’ll put some here. But meanwhile, here’s quite a scary picture. Hey, didn’t I say Halloween was for kids.